[We] have been sitting here for the better part of an hour talking through what I learned from you today and looking over the resources on Sprocket's website. At the risk of getting emotional as I type this, I just want you to know that for the first time in 3+ years, I feel like a way exists to actually, practically relieve some of the extreme frustration our kid experiences on a daily basis. We love him so freaking much, and he is just the best kid, but LORD HAVE MERCY at the number of times we've been tempted to put him at the curb with a "free to good or questionable home" sign strapped to his torso. More often than not, we fall into bed at night exhausted from the battle(s) of the day, feeling like we've failed him again and again but having no idea how to be better the next day. Reading through the regulation and reflex information made us feel like we can finally DO SOMETHING to legitimately help him, and whatever your recommendation is for continued therapy, we're all in. I hope you get e-mails like this all the time for the work you do. With all the mushiness I can muster, thank you again. Eli loves to come to Sprocket and I dread the day I have to tell him he is finished there. The team has been so wonderful with him and the progress he has made is astounding. Dan is his primary therapist and my son LOVES him. Dan and Nat often work together with my son and another little boy and the combination of the therapists and the benefit of the social interaction with the other child has worked well for Eli. Their approach is unique and dynamic, and perfectly geared toward my child. 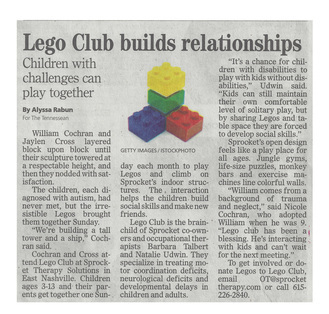 Everyone at Sprocket has been supportive and helpful to us and I recommend them constantly to other families.
" Nat and Barb went beyond the call of duty to help our family. With patience and without judgement they entered into our challenges. We are forever grateful for their persistent, compassionate, wise, generous, and creative efforts to help our daughter and to help us as parents. On days that we felt discouraged, they held out hope and reassured us that progress was being made. We all gained so much from our time at Sprocket." When you press submit, your testimonial will be sent to us for review before we add it to our webpage. Thank you so much for support!